End of this year (or maybe early next year), a few of our close friends are going to move into their new home. I am thinking about giving something personalized as housewarming gifts. If the time permits, maybe I will do something crafty with my collection of decoupage or scrapbooking items, but if not getting something on the shelves would be a good idea to save on time and effort. I think for the couple who is going to move into their double storey terrace house, I will get them this personalized doormat. 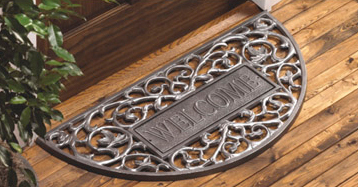 This doormat is cast aluminum from an original wood carving, with welcome inset plate or personalized characters. The mats are available in two colors – French bronze and pewter. It will be a nice idea to personalized the inset to be their family name, right? As the doormat is a personalized gift, it will take around 5 weeks for manufacturing and ready for shipping. Maybe if they are going to move in next month and decide to throw the housewarming party soon, I need to look for other type of gifts that could be completed in faster time. 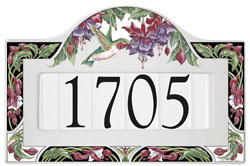 Getting address plaques or house signs as housewarming gifts will be a good idea as well. But of course I need to know their exact home address..heh! I think if you are in real estate business, having all these items of house signs and address plaques will be a great closing gifts for real estate agents, builders and mortgage companies. But of course with such unique personalized gifts like doormats will also make great holiday or wedding gifts!